A Teaspoon and A Pinch: Happy Birthday Dr. Seuss!! Today is the Dr. Seuss' Birthday!! My kids love Dr. Seuss Books!! 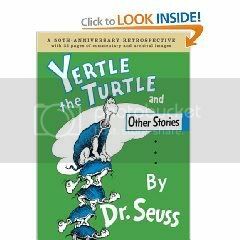 Our Favorite is Yertle the Turtle. When I got my e-mail newsletter from Barbara Beery @ Kid's Cooking Shop, I knew that I would love to celebrate with my kids by cooking up Green Eggs and Ham Scramble and Pink Yink Ink Drink. Both recipes were very easy to put together and I was so excited about the amount of fruits and veggies that were in them!! While I left out the pesto (I forgot it at the grocery store) I am thinking about trying out this recipe again...It would make a great late night supper or late Sunday Brunch. Green Eggs and Ham Scramble - 4 spoons. Pink Yink Ink Drink - 5 spoons. Heat the butter in a medium skillet over medium-high heat. Add the spinach, ham, and scallions to the skillet, stirring with a wooden spoon to combine. 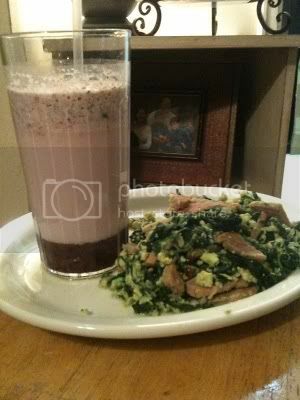 Cook for 2 minutes, and then pour the eggs over the spinach mixture. Allow the eggs to begin to set. Stir in pesto, salt, and pepper and cook until eggs are cooked evenly. 1. Put the blackberries in a blender and puree them. Pour into a large glass. Put the milk, strawberries and honey in a blender and blend. Pour the strawberry mixture carefully on top of the blackberry mixture and swirl with a spoon. Recipes from e-mail newsletter @ Kid's Cooking Shop. Visit Barbara Beery's Kid's Cooking Shop Blog Here. Oh my gosh! What fun! Thanks for posting this! That main dish actually made my tummy growl! I love spinach and ham together! What a cute theme for today!!! seriously too cute of an idea! What a fun way to share.. Thanks.. I will try this.